BEYOND: Two Souls is an interactive game in which you follow the nonlinear narrative of the life of Jodie Holmes, the game’s main protagonist. Jodie, who is voiced and motion captured by actress Ellen Page, is a young woman who has been bound to an otherworldly entity since birth. This entity, who is named Aiden, is somewhat like a ghost in that he is unseen to the human eye but felt by Jodie and others with whom he interacts. Since Aiden is bound to Jodie, they both share a dynamic bond with one another. There are times when Jodie becomes angry with Aiden and the fact that his presence prevents her from having a normal life, but she also loves him since he is a constant companion to her. While it may be complicated at times, this relationship plays a huge role throughout the game and their connection to one another is main backbone of the story. The game starts with a prologue in which Jodie states her confusion about the order in which events in her life have occurred. This explains why the main story chapters are played in an out-of-order sequence. Between chapters we see a timeline which bullet points when all the playable events take place, starting with the prologue which is at the very end, and this helps to place these events in order for the player. I will admit that towards the beginning it can be a little confusing to get used to these jumbled sequences. Playing as Jodie when she is a child then moving into her being an adult only to step back to her being a teenager can seem disorganized but I believe that this happens in order to put the player in Jodie’s shoes. She too is recalling them in a scattered order so her bewilderment becomes your bewilderment. As things begin to progress, the disorientation issue will fade and things will fall into place, creating revelation moments throughout the game’s narrative as instances are explained to and witnessed by the player. There are various side characters throughout the game, such as Nathan Dawkins who is voiced and motion captured by Willem Dafoe. Nathan becomes a father figure to Jodie at a young age and the bond they develop is nearly as strong as the bond between her and Aiden. He is her mentor and she strives to not disappoint him while struggling with the issues of growing up and living with an entity. Other characters include Cole Freeman and Ryan Clayton who both play equally significant, yet entirely different roles in Jodie’s life. These characters and many others in the game are not only well done as far as personality and voice acting goes, they also serve a purpose. Even the small time characters that are only seen once or twice play their parts well and are a true testament to David Cage’s (BEYOND’s writer and director) talent. After playing Heavy Rain, a game with extremely mediocre voice acting, I was most surprised with how great the voice overs in this game were. If you have played Heavy Rain or Indigo prophecy then you already have an idea about how the gameplay is handled. It’s all about choices made and the general experience of the game rather than run-and-gun action. The action displayed comes from hand to hand fighting sequences in which time slows down allowing the player judges which way Jodie needs to move her body to block and attack or hit a foe. 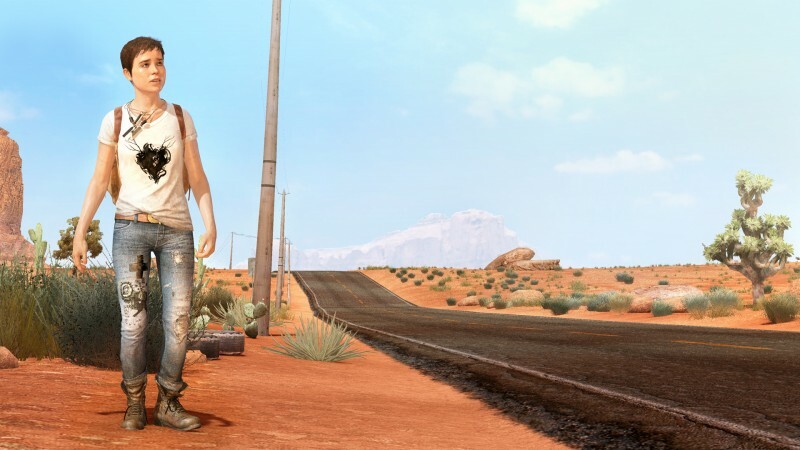 Most of the other gameplay consists of walking or running and holding down a sequence of buttons on the controller to accomplish a set task. While this may be construed as a lack of gameplay or a boring experience, I believe that it is simply another way in which to play a video game. Focusing on narrative and character development rather than whether or not you can kill a boss in X amount of time is one way in which players can really live in the moment, truly experiencing the game. Jodie is not the only character that can be controlled by the player, Aiden is also a playable character throughout the game. Using Aiden allows you to slip into his shoes, controlling him and allowing him to help Jodie. He can not only go through walls, open doors/windows, and see things that Jodie can’t, he can possess and/or knockout/kill enemies. Possessable enemies glow orange and can be controlled by Aiden. Possessed enemies can be moved around or simply used to infiltrate areas and kill other enemies. 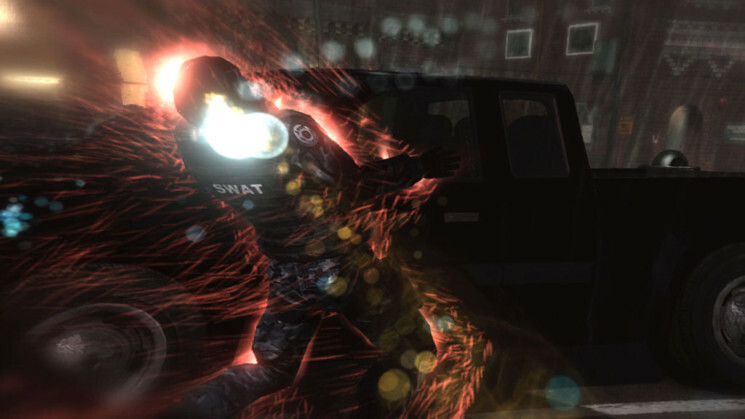 Enemies that glow red can be choked out by Aiden, resulting in either death or a knockout. Aiden can also do typical ghost things such as breaking mirrors or knocking water bottles over. The way he is used is as a companion to Jodie, he is there to help her and assist her which fits right in to the narrative. An innovative feature involved with this game is the BEYOND Touch app for cell phones and tablets. This app allows you to play the game (yes, the entire game) with your mobile device. The best part is that it works really well and happens to run smooth, there’s no time lag and I never came across a single glitch while using it. 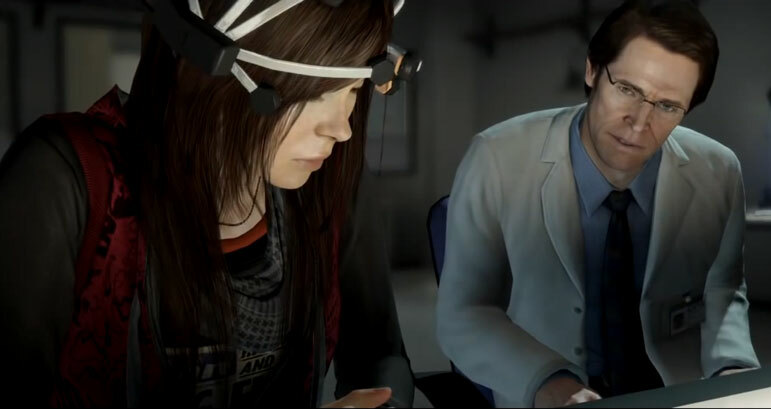 BEYOND: Two Souls can also be played in duo (or co-op) mode. Two human players can play the game together locally, one controls Jodie and the other controls Aiden. The best part is that the app and duo mode can work together. For example I can play Jodie with the controller while a friend controls Aiden with a tablet, and vise-versa. The app isn’t required for duo mode and both players can use controllers if they want, it’s not a requirement. One thing to note is that the app connects to your PlayStation 3 via Wi-Fi, older consoles without the Wi-Fi connectivity will be unable to work with the app. The overall presentation of this game is marvelous. As I said earlier, it’s truly about the story and the general experience, there’s no doubt that Quantic Dream exceeds in both departments. The quality of the graphics as well as artwork in this game are fantastic. Not only do the settings and the characters look extremely realistic, the game itself is vivid and beautiful all around. Some settings are just stunning on a massive scale and others are detailed and beautiful on a smaller scale. When paired with BEYOND’s gorgeous soundtrack, the game absolutely enthralling to a grandiose extent. Since BEYOND: Two Souls has heavy entity influence you should expect some horror elements in certain areas, but there are also parts of the game in which the entity thing is much less prevalent which rounds the game out rather nicely. It’s an emotional roller coaster, one moment you may be joyous only to become very distraught in the next sequence. I find emotion to be the catalyst for character connection and thus felt these emotional scenarios were not only necessary but brilliant. Another factor that I found interesting about the emotional aspect was that it never felt forced, it was all natural and built off genuine emotion on the players part. In conclusion I feel that this game is certainly worthy of praise in various departments. The story line is intense and meaningful, provoking the full spectrum of emotions from the very beginning. Players should end up with a strong emotional bond to Jodie’s character, sympathizing with what she is going through and striving to help her find peace and have a normal life. Gameplay is typical of a Quantic Dream game, but showcases a lot more spice, flare, and precision than past games. While it may feel linear it really isn’t, all choices made in the game make a difference, whether it be long-term or short-term. The game is presented in a great way, truly a marvel of this current video game generation. Environments are detailed and polished and characters are outstanding, mostly due to the massive talent behind them such as Dafoe and Page. 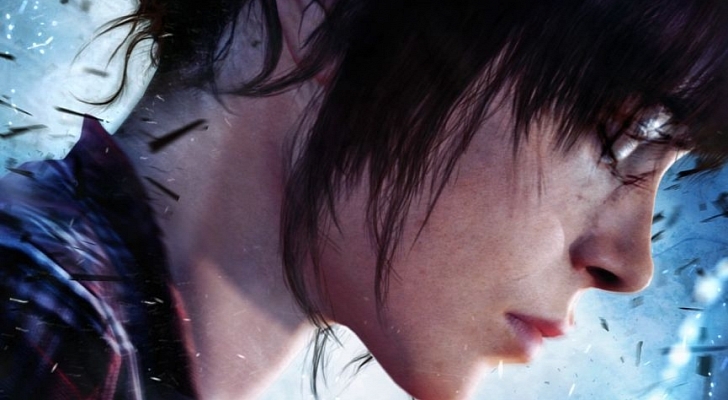 There is no doubt that BEYOND: Two Souls is a wonderful game with a captivating presence and an awe-inspiring experience for all gamers everywhere. Great review, Lady. The review flowed perfectly and kudos to getting rid of the number scale, those are so outdated. Beyond: Two Souls has quickly become one of my favorite games of the year, I’d put it up there with Bioshock Infinite and The Last of Us. It’s that good. The game is gorgeous and the inconstant storytelling just makes it more interesting, trying to put the pieces together and find out how Jodie got to that point. Even though it’s a game, I’d say this is one of Ellen Pages’ best roles. She put her entire, excuse the pun, soul into the game and you can tell. It’s a game I won’t soon be forgetting, and will be playing again and again for years to come. After reading this I just…have to get this game :O my wallet cries…. I just reviewed this game today too lol. I don’t like it as much as you do but I think it’s a good game :]. Great review; glad you liked it! I played the demo and enjoyed it mostly. There were definitely times where I didn’t understand what I was doing or was suppose to be doing, but it seemed like a good experience overall. I like the demo enough to where I know I’ll pick the game up at some point, which was surprising to me since I didn’t care for Heavy Rain at all.